With the green light to build a new school, the Dalton Board of Education voted Monday night to purchase 38 acres and plans to buy another 25 early next year. The newest land is technically coming to the public school system as a donation, though the board has has agreed to pay $350,000 in Realtor fees to close the sale. The board will use the land to build an academy for sixth and seventh graders, aiming to lower attendance at the middle and high schools. The elected officials voted to accept the donation without any discussion Monday. The decision comes a week after Dalton voters approved a referendum for a long-term loan to pay for the new school, with 52.4 percent of 1,816 voters approving the plan Nov. 7. The board will issue a 30-year bond in 2018. Dalton Public Schools administrators have projected a principal cost of about $50 million, plus another $30 million in interest. With the new school housing sixth- and seventh-graders, Dalton Middle School will host eighth- and ninth-graders. The high school, meanwhile, will have only sophomores, juniors and seniors. The new school will be located across the Dalton Bypass from the middle school. Dalton-By-Pass Properties, a company registered to Bryan Hair, donated the 38-acre tract. Hair is also the CEO of Marketing Alliance Group, which designs and builds "visual merchandising products" such as custom lighting, product displays, signs and 3D models. Hair planned to use the property to build condominiums and retail space, Board of Education Chairman Rick Fromm said. Earlier this year, he received a market analysis of the property, showing it would not be an ideal location for some of Hair's plans. In May or June, Fromm said, Realtor Chuck Dobbins told the board that Hair would be interested in donating that land. In addition to the 38 acres, the board plans to buy another 25 acres from Hair next year. The board plans to spend $1.8 million on that purchase, located next to the donated land. Fromm said Hair did not donate the 25-acre tract because the market analysis showed that piece of land was actually valuable. Fromm said earlier this year the board wants the extra 25 acres in case it needs it down the road. If the system's population continues to grow, for example, the board might build an elementary school there. An employee of Marketing Alliance Group told the Times Free Press that Hair was out of the office Monday and would not be able to return a call seeking comment. Hair also did not respond to an email from a reporter early Monday afternoon. The board will buy the extra land next year with money from sales tax revenue, coming in from ESPLOST IV. That 1-percent sales tax passed in 2012 and ends this December. The board planned how it wanted to use most of the revenue. But Dalton Public Schools Chief Financial Officer Theresa Perry said the board will get about $2.2 million that the elected officials had not previously earmarked. The board plans to purchase the added property early next year, when school administrators account for all the money. "You still would have a remaining balance of about $450,000 for some other project that might come up," Perry told the board Monday. The board also plans to get $3.9 million from state school officials for the construction of the sixth- and seventh-grade academy. The money will come as a reimbursement once the project is finished, Perry said. When planning the academy, Dalton Public Schools administrators did not set aside this state funding for the construction of the project. As a result, the total amount of money the board plans to bond out for the construction will be lower than advertised before the vote, Fromm said. The board originally said the project would require a bond of about $50.7 million. But administrators did not factor in the sales tax revenue that it could use to buy the extra 25 acres. The plan also did not include the reimbursement from state officials. Perry said they will plan to get $2 million from the state, rather than the full $3.9 million — just in case the state money comes in slower than anticipated, or in case less money comes in overall. As a result, the board plans to issue a bond of $46.9 million, about $3.8 million less than the advertised amount. 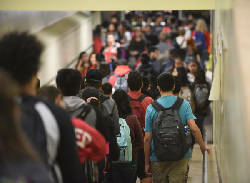 As of Monday, Dalton Public Schools spokeswoman Pat Holloway said, 1,904 students were enrolled at the high school, about 1.5 percent above capacity. Another 1,805 students were enrolled at the middle school, which is about 3.1 percent above capacity.